The Intel 815E chipset was such a highly anticipated component, and when it arrived, many pro-Intel types breathed a sigh of relief. 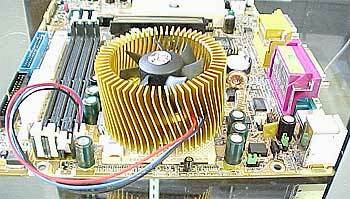 Intel had finally released a chipset supporting many important features such as, 133MHZ fsb, AGP 4X compliance, as well as the much needed TRUE PC-133 SDRAM support. Gigabyte has quickly jumped on the i815 bandwagon, by releasing a couple of new motherboards. The one under scrutiny today is none other than the Gigabyte-60MM7. 1 x Gigabyte-60MM7 Micro-Atx motherboard, 1 x ATA66 cable, 1 x floppy cable, 1 x manual, 1 x CD: Drivers, DirectX 7, Suspend to Disk Utility, and Norton 2000 SE.